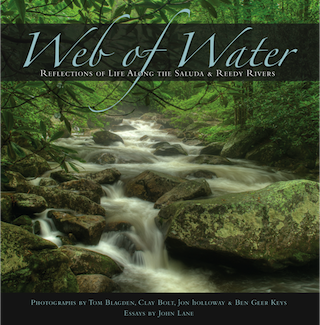 Web of Water: Reflections of Life Along the Saluda and Reedy Rivers is an award winning book that takes you on a journey through the Saluda-Reedy watershed, which has been a major focus of Upstate Forever’s work since 2003. The trip that unfolds through a collection of essays by John Lane and the fine-art photography captured by photographers Tom Blagden, Clay Bolt, jon holloway, and Ben Geer Keys. Located in one of the fastest-growing regions of the Southeast, the Saluda-Reedy watershed reaches from the Blue Ridge Escarpment along the North Carolina-South Carolina border to Buzzard’s Roost dam on the Saluda River and Lake Greenwood. Nearly 400,000 people live, work, and recreate here in an area encompassing more than 1,500 square miles—and for good reason! Full of natural beauty and rich in biological and historical significance, the Saluda and Reedy Rivers and the spectacular 11,400-acre Lake Greenwood are sources of drinking water, tourism, industry, and cultural significance for the Upstate and for much of the state. In 2015, Web of Water was nationally recognized by the Printing Industries of America with a 2015 Premier Print Awards Certificate of Merit in Art Books. It also won the 2014 “Best of Category” award in Hardcover books from the Printing Industry of the Carolinas. The book is available for purchase at Upstate Forever's offices and at select retailers. Contact us at info@upstateforever.org to learn more. jon’s professional career has allowed him to travel the globe, creating photographic exhibits on South Carolina, India, South Africa, Cuba, Gates of the Arctic, 500 Years: Native America, Spirit, Solitude, and Nature’s Rhythm as a testament to his artistic vision. He lives and has a studio in Greenwood.